I'm not entirely familiar with the world of beat-boxing; I know what it is and what people do but it's not something I really took an initiative to learn more about. I have a friend in my class, Mel, who is helping to promote the Canadian BeatBox Championships to find a winner for the World Championships in Germany for 2011, and I feel like helping her out with a shout-out and promo with my blog. 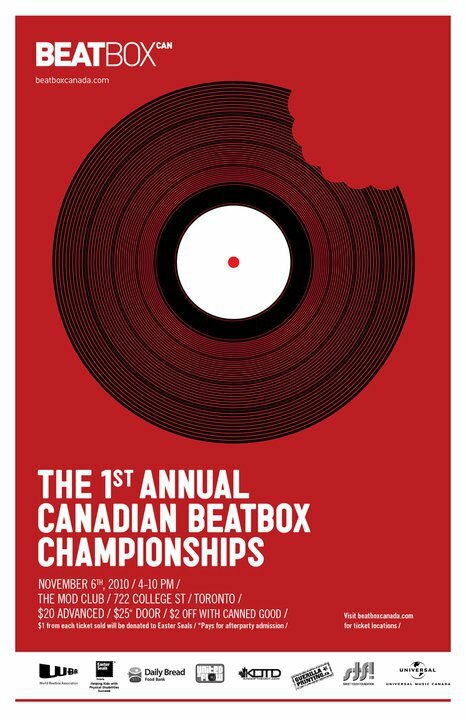 The event is the Canadian BeatBox Championships. It will be held on Saturday, November 6, 2010, from 4 p.m. to 10 p.m. at The Mod Club in Toronto, Ontario. There will be 16 competitors dueling it out to be crowned the ranking Canadian winner. There will be festivities, maybe a celebrity or two, innovative and creative performers, and much more. I've been told that it will be a great event to check out so if you are in the Toronto area then take a trip to The Mod Club and cheer on our Canadian winner. For more information about the event, then visit their website or follow them on Twitter to learn more.